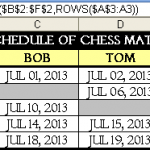 I previously posted this example showing how to enter separate lines of text into a single cell. 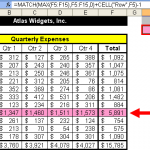 This example shows how to move each line of a cell’s text into its own cell. Note the absolute and relative references. 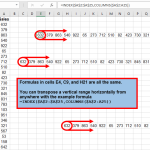 I previously posted this example, of transposing a range by copying it, and selecting the Transpose method in the Paste Special dialog box. 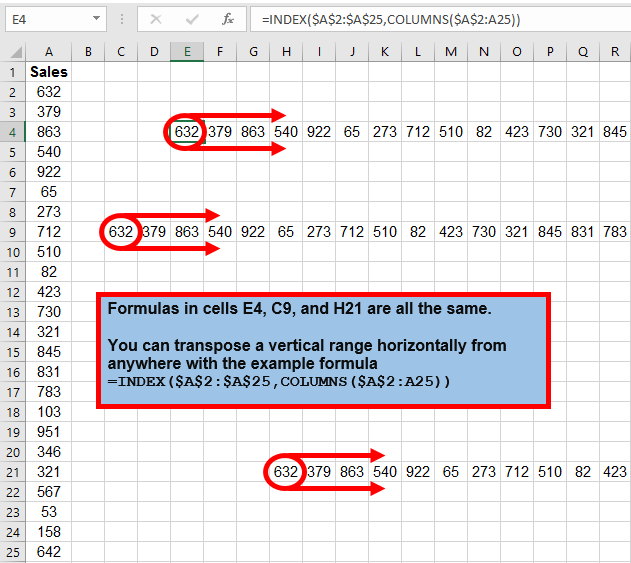 There are plenty of projects that require an immediate transposition using a formula to avoid the burden of manual Copy and Paste Special for Transpose every time a header cell changes. 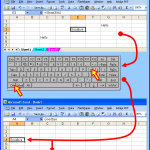 There are times when your users will find it easier to enter data directly into worksheet cells, instead of a userform interface. You’ll want to protect all the cells containing formulas and static header labels, while allowing certain cells to be unprotected for users to input data. In yesterday’s tutorial, I posted this example to return the relative row number of an item in a list. 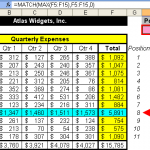 You’ll sometimes need to know the relative position, such as the relative row in a list or table of an item. 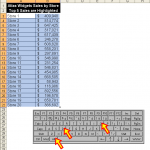 This is usually different than the item’s actual row on the Excel spreadsheet grid. 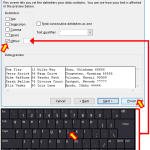 Here’s an example of using Data Validation to NOT allow a particular data item entry. 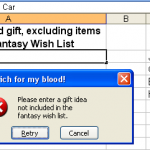 Suppose you want to insure that anything can be entered into a cell, EXCEPT for certain items you specify. 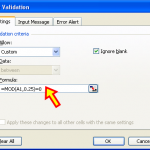 Data Validation is an excellent way to control data entry to meet a certain condition. 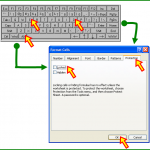 Here’s a cool tip for the keyboard shortcut Ctrl+[ which takes you from the formula cell you are on, to the precedent cell (if there is one) of that formula.